It was 9.30pm on the last Saturday in May. As soon as I got out of my air-conditioned ride, sweat started trickling down slowly but surely. Such a humid night! I tried to push this out of my mind, making my way to the bag-deposit place for the 10K runners. Dropping off my bag was quick and painless, so that was a good start. Found some friends and as we headed to the starting pen together, we searched high and low for some drinking water. I went to the information booth and got glow sticks (cool!) instead. I asked the ladies behind the counter about the location of the nearest hydration station, and they told me it was right in front of the row of toilets near the starting pen. When we got there, we couldn’t see the hydration station. 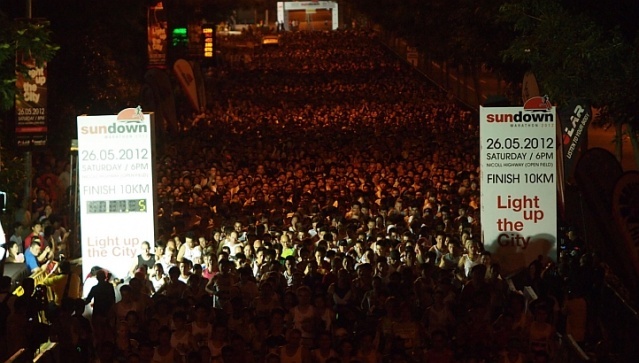 We asked two more people who were part of the Sundown Marathon crew and they both pointed to different directions. All we needed was water before the start of a race, and it was this impossible to get? Ridiculous. Overcome by thirst, we went to join the rest of the 10K runners and before we knew it we were on our way. 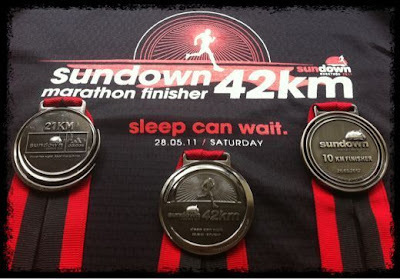 I was really dreading having to tread boring ol’ Nicoll Highways three times (KM’s 1 to 5 with a u-turn at about 1.5K, and KM 8.5 until the finish) but I really wanted to get that 10K Sundown medal. 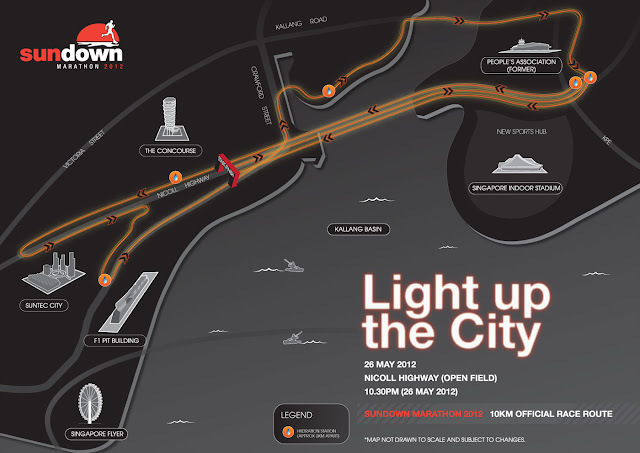 So, what can I say about a race that’s predominantly at Nicoll Highway that I haven’t already said before? It’s the same insanely monotonous stretch that’s usually hot hot hot, since there are hardly any trees on this long stretch of road that has become so popular with Singapore race organizers these days. And that night, even though Mr Sun had already gone to bed, was no exception. My body temperature shot up soon after I started running no thanks to the heat that was rising from the asphalt. And seriously, having 6.5 out of the total 10 kilometres of your race on the same road is disgusting. I know Singapore is small, but it’s not THAT small! Anyway, once we hit Kallang Riverside Park things got a little dangerous as it was so poorly lit. I consciously slowed down my pace for fear of accidentally stepping on something unstable, which is fine by me as I wanted to take this race slow and steady. But I really sympathise with those people who wanted to run their best race and get a new PB. The worst part of all was when they made us squeeze into a narrow lane to exit the park and get back onto Nicoll Highway at KM 7+. Runners basically had to come to a halt and queue two-by-two at this point. In the middle of a race! I’m sorry, but why not use the set of stairs right next to it that led to the same place anyway? It’s wider and thus accommodates about four to five runners at once. By the time I got there, a couple of guys convinced the guarding volunteers to allow some of us through via these stairs. Of course, those stuck in the “queue” were cursing, but honestly I took the road less taken not to cheat but to not become a sardine in a can! All in all, I only did this race for two reasons: (1) to get back into running (since my Vancouver Marathon on May the 6th, I'd only run three very easy 5K's with the last one being nine days prior to Sundown), and most importantly, I realized that this was my chance to complete my trio of Sundown Marathon medals from three consecutive years. 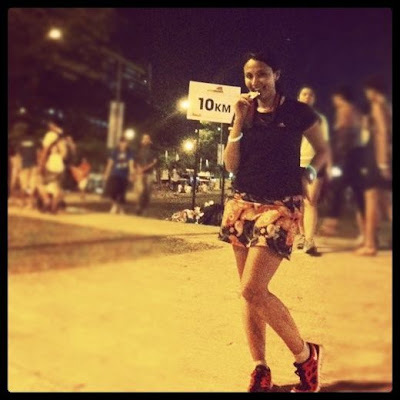 At the 2010 edition, I ran my very first half-marathon (or pseudo-21K since it fell short by 3km or so). And the same weekend last year, I completed my most painful Full Marathon (my #2) in a PW timing of 6:16. Will I run Sundown again? Most probably not. After three tries, I’ve realized that late-night races are just not for me!